On a weekend where Torrey Pines hosted the biggest stars in golf, the hottest ticket in town was for the UC San Diego men’s volleyball home opener on Friday, Jan. 25 against the UCLA Bruins, with a near-record crowd of 1,648 piling into RIMAC Arena for a game televised on ESPN3. The Tritons took advantage of their mobility and ability to make serves in the first set, but in the end, the Bruins’ big men up front were too powerful for the Tritons. While the Tritons put up a good fight, the Bruins ultimately overcame the home team’s advantage, winning the match 3–1: 20–25, 25–17, 25–15, and 25–23. Half of the arena was empty for the cameras, but that didn’t do anything to lessen the buzz, and neither did a late-arriving crowd. If anything, UCSD was at its best early on in the game, fighting off the jitters that accompany playing on ESPN against one of the best teams in the nation to take the first set 25–20. The first set was characterized by missed opportunities by UCLA, and the errors began right away, as the Bruins missed their very first serve of the match to give the Tritons the early 1–0 lead. UCSD led for the entire way, leading by as much as 6 points over the course of the set. Sophomore outside hitter Wyatt Harrison and redshirt sophomore middle blocker Vlad Pesic paced the Tritons early on, collecting the team’s first 2 kills of the night. The first big run by UCSD came in response to a powerful hit down the middle from UCLA’s Daenan Gyimah that made the score 12–10. After this resounding spike, the Tritons scored 3 straight points on kills from Harrison and Pesic, followed by 2 blocks by Pesic, the second of which earning UCSD a 15–10 lead. The momentum was noticeable, and as more fans began to trickle in, UCLA called their first timeout of the game. Despite scoring the first point coming out of the timeout, the Bruins missed their next serve to bring the score to 16–11 and then missed another serve at 17–12, with the student section doing their best to yell to try to distract the servers of the visiting Bruins. 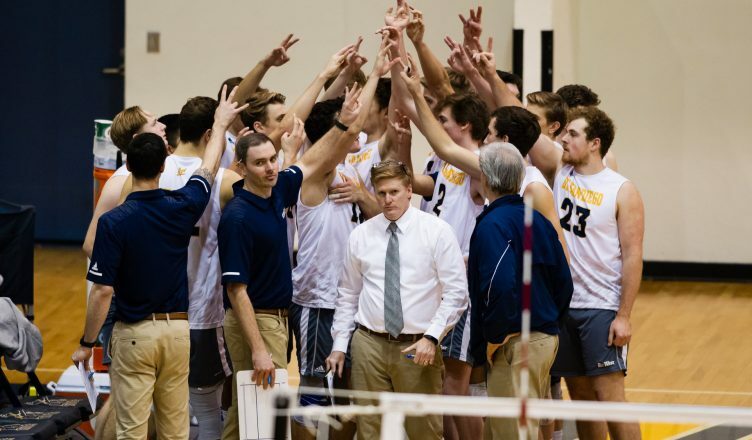 By set’s end, the Tritons seemed to be in control of the match, with the final kill by freshman middle blocker Shane Benetz eliciting a wild roar from the crowd. But the Bruins would not be upset. Over the next 3 sets, UCLA dominated up front, striking 40 kills to UCSD’s 24. The Bruins’ three-headed monster up front was led by outside hitter Brandon Rattray, a transfer from the University of Hawaii who led all players with 21 kills, with fellow-Hawaii transfer Austin Matautia and Gyimah contributing 11 and 9 kills, respectively. While the first 2 sets ended quickly, the Tritons came back with a vengeance in the fourth set, nearly taking it from the heavily-favored Bruins. UCSD scored its first 2 points via missed serves, a common theme on the night that UCLA was able to overcome. The Bruins missed 24 serves on the night to the Triton’s 19. The fourth set featured 17 tie scores and 6 lead changes. For comparison, the previous 3 sets combined only saw 4 tie scores and 1 lead change. UCSD first took the lead on a kill by freshman middle blocker Logan Clark to go up 5–4, but Clark promptly followed that up by missing the serve. After going back-and-forth, freshman setter Berkeley Miesfeld unleashed an ace to give the Tritons a 13–11 lead, prompting a UCLA timeout. In what was a common occurrence for these two teams, Miesfeld came out of the timeout and missed the serve, but was somewhat helped by Gyimah missing his serve on the following play to make the score 14–12, a sequence that played out again at 19–19 and 20–19. At this point, redshirt outside hitter Xander Jimenez had a big block, prompting an outburst from the crowd and consequently a timeout by UCLA, with UCSD holding on to a 21–19 lead. The Tritons would never lead by 2 points again for the rest of the match. UCLA went on to tie the score at 21–21, which led to a timeout by the home team, before going on to take a 24–23 lead. The Tritons faithful screamed and stomped desperately to try and force a missed serve by UCLA, but the Bruins were able to stay composed, winning the set and the match on a kill by Matautia. Matautia’s drive was blocked at the line by the Tritons back into the hands of the Bruins before deflecting out of bounds, but the referees ultimately awarded UCLA the point despite the animated protests from the UCSD sideline. The Tritons had to have a short memory though, as they were slated to take on the Grand Canyon University Antelopes the next day, sweeping them 25–20, 27–25, and 25–19 in what was their first home win of the season. Harrison paced UCSD with 17 kills, with Miesfeld, Benetz, and Jimenez adding 7 kills, 4 kills, and 4 kills, respectively. Up next on the schedule for the Tritons are four more games within the friendly confines of RIMAC Arena, with the next matchup coming against the Princeton University Tigers on Tuesday, Jan. 29 at 5 p.m.